Subdivide a segmentation using regular expressions. This widget inputs a segmentation and creates a new segmentation by subdividing each original segment into a series of new segments. By default, it works on the basis of a description of the form of the new segments (by means of regular expressions); alternatively, it can also operate based on a description of the separators that appear in-between the segments. It also allows the user to create annotations for the output segments. The interface of Segment is available in two versions, according to whether or not the Advanced Settings checkbox is selected. Figure 1: Segment widget (basic interface). The Options section allows the user to define the output segmentation label. The annotations of each input segment are systematically copied in the corresponding output segments (see Advanced interface, option Import annotations). The Info section gives indications regarding the current status of the widget instance (see Messages below, section Information). 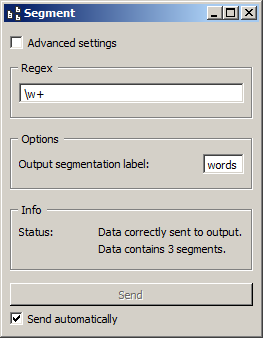 The Send button triggers the emission of a segmentation to the output connection(s). When it is selected, the Send automatically checkbox disables the button and the widget attempts to automatically emit a segmentation at every modification of its interface or when its input data are modified (by deletion or addition of a connection, or because modified data is received through an existing connection). Figure 2: Segment widget (advanced interface). The advanced interface (see figure 2 above) presents similarities with that of the Text Files, URLs, and Recode widgets. The Regexes section allows the user to define the regular expressions applied successively to each segment of the input segmentation and to determine their application order. In the list which appears on top of the window, the columns indicate (a) the mode associated to this regular expression, namely t for Tokenize (default) or s for Split, (b) the actual expression, (c) the corresponding annotation (if any), and (d) the options associated to this expression. On figure 2 above, we can thus see that four regular expressions have been defined, each in the Tokenize mode; each identifies a type of character in the input segmentation and assigns to it an annotation whose key is type. The character classes identified by the four expressions are not mutually exclusive, however after having successively applied them, the widget automatically sorts the segments (exactly like the Sort segments option of the Merge widget) and fuses those whose addresses are identical, given that the Fuse duplicates option is selected, which triggers the fusion of segments with identical addresses (see below). In the end, each character thus belongs to a single segment, whose value for the annotation key type is the last one that was assigned to it according to the regular expressions application order. The first of the four expressions (.) creates a segment for each character and assigns the annotation value other to it. The second (\w) creates a segment for each alphanumerical character, and assigns the annotation value consonant to it. The last two respectively identify vowels ([aeiouy]) and digits ([0-9]) and annotate them as such. To illustrate the mechanism explained in the previous paragraph, it can be noted that before segment sorting and duplicate fusion, each vowel of the input segmentation is associated with three segments whose values for the annotation key type are (in order) other, consonant, and vowel; after sorting and fusion, only the last of these values is retained. The first buttons on the right of the list of regular expressions allow the user to modify the order in which they are successively applied to each segment of the input segmentation (Move Up and Move Down), to delete an expression from the list (Remove) or to empty it entirely (Clear All). Except for Clear All, all of these buttons require the selection of an entry in the list beforehand. Import List enables the user to import a list of regular expressions in JSON format (see JSON im-/export format, Regular expression list) and to add them to those already selected. Export List enables the user on the contrary to export the list of regular expressions in a JSON file. The remaining part of the Regexes section allows the user to add new regular expressions to the list. To do so, the regular expression should be specified (Regex) as well as, optionally, the annotation key and the corresponding value (Annotation key and value). The Ignore case (i), Unicode dependent (u), Multiline (m) and Dot matches all (s) checkboxes control the application of the corresponding options to the regular expressions. Adding the new regular expression to the list is executed by finally clicking on the Add button. Segment is one the widgets that can be controlled by means of the Message widget. Indeed, it can receive in input a message consisting of a regular expression list in JSON format (see JSON im-/export format, Regular expression list), in which case the list of regular expressions specified in this message replaces those previously specified (if any). Note that removing the incoming connection from the Message instance will not, by itself, remove the list of regular expressions imported in this way from the Segment instance’s interface; conversely, this list of files can be modified using buttons Move up/down, Remove, etc. even if the incoming connection from the Message instance has not been removed. Finally, note that if a Segment instance has the basic version of its interface activated when an incoming connection is created from an instance of Message, it automatically switches to the advanced interface. Data correctly sent to output: <n> segments. This confirms that the widget has operated properly. Settings were (or Input has) changed, please click ‘Send’ when ready. Settings and/or input have changed but the Send automatically checkbox has not been selected, so the user is prompted to click the Send button (or equivalently check the box) in order for computation and data emission to proceed. No data sent to output yet: no input segmentation. The widget instance is not able to emit data to output because it receives none on its input channel(s). No data sent to output yet, see ‘Widget state’ below. A problem with the instance’s parameters and/or input data prevents it from operating properly, and additional diagnostic information can be found in the Widget state box at the bottom of the instance’s interface (see Warnings and Errors below). A regular expression must be entered in the Regex field in order for computation and data emission to proceed (in the advanced interface, the Add button must also be clicked). A label must be entered in the Output segmentation label field in order for computation and data emission to proceed. No annotation key was provided for auto-numbering. The Auto-number with key checkbox has been selected and an annotation key must be specified in the text field on the right in order for computation and data emission to proceed. JSON message on input connection doesn’t have the right keys and/or values. The widget instance has received a JSON message on its Message input channel and the keys and/or values specified in this message do not match those that are expected for this particular widget type (see JSON im-/export format, Regular expression list). The widget instance has received data on its Message input channel and the data couldn’t be correctly parsed. Please use a JSON validator to check the data’s well-formedness. The regular expression entered in the Regex field is invalid. Regex error: <error_message> (regex #<n>). The n-th regular expression in the Regexes list is invalid. Reference to unmatched group in annotation key and/or value. In the advanced interface, a regular expression has been associated with an annotation key–value pair and in at least one of these terms reference is made to a numbered variable (&1, &2, ...) which turns out to not always have a matching element. This possibility does not apply when the widget is configured to identify the separators rather than the segments themselves (Mode: Split, see Advanced interface). It should be noted that the -u (Unicode dependent) option is activated by default (see Python documentation). NB: in Split mode, empty segments that might occur between two consecutive occurrences of separators are automatically removed (this is because the data model adopted by Orange Canvas cannot represent empty segments). In the case where the fused segments have distinct values for the same annotation key, only the value of the last segment (in the order of the output segmentation before fusion) will be retained.